The township of Beachmere, in the northern section of Moreton Bay Region between Deception Bay and Sandstone Point, is a quiet hideaway perfect for a bayside nature reprieve. You’ll find a 2-lane boat ramp and pontoon with plenty of parking, toilets and water available at the end of Saint Smith Rd. The ramp will launch you into the Caboolture River from where you can either navigate up the river or out into the bay, into Pumicestone Passage or Burpengary Creek, or towards Deception Bay, Scarborough, or even Moreton Island. For those without their own powered or unpowered vessel, you’ll find boat hire places nearby in Sandstone Point and on Bribie Island. 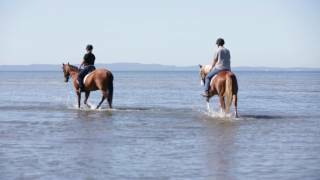 As Beachmere is not far from the Queensland State Equestrian Centre in Caboolture, it’s not uncommon to see riders and their faithful steeds trotting along the waterfront at low tide in preparation for equestrian events (or simply for fun). Bring the family for some beach play. You can enjoy an undercover picnic in Moreton Terrace Park as you watch the kids play on the beach – making sandcastles, wading & splashing and watching on mesmerized as multitudes of tiny soldier crabs scuttle along the mud flats at low tide. Families with dogs are also welcome to visit. Off-leash pups can traipse south from the southern end of Biggs Avenue (adjacent to the carpark) to the mouth of Caboolture River along the foreshore only. On-leash dog friendly areas include the foreshore area between the southern end of Biggs Street and Louise Drive. You can also go on-leash on the foreshore parkland adjacent to Timothy Esplanade and Bakers Flat Road. Located along the Moreton Bay Marine Park waterfront between Sandstone Point and Beachmere, the Godwin Beach Environmental Reserve is a wonderfully quiet place for a leisurely walk through various vegetation habits including mangrove, melaleuca, woodlands and open forest. Your best entry point to access the main walking circuit is from the eastern end of the Godwin Beach esplanade.